It’s no surprise the little Civic is still the bread-and-butter car of the Honda lineup. It is an excellent vehicle for getting about the city – quick and economical with good traction in the snow from its front-wheel-drive system. 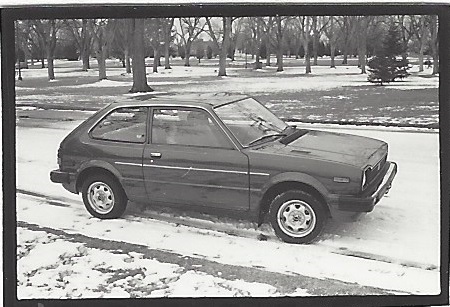 Driving an ’81 Civic 1500 DX Hatchback in Denver resulted in fuel mileage of 34.8 miles per gallon. The 1,800-pounder was equipped with a 1,488 cc engine and is one of the faster 4-cylinder subcompacts on getaway. The 5-speed manual transmission is shifted easily, with no push or pull or slap required to engage reverse, just move it in. Under-the-hood working room is plenty, and the plugs, oil filter, alternator and battery are reached easily. Quality and craftsmanship of the Japanese-built Honda show in tightness of the body. Controls are well-placed except those for the rear wiper and defogger, which are around to the side of the main instrument panel. Basic price of the Civic 1500 DX is $5,099, which includes steel-belted radial tires, remote hatch release, intermittent windshield wipers and rear window wiper, washer and defroster. High-altitude emission control equipment added $30 to the price, undercoating was $47 and freight of $172 brought window sticker total to $5,348. Turning circle of the Civic, which has 13-inch wheels, is only 31.5 feet. On a wheelbase of 88.6 inches, it is 148 inches long, 62 inches wide and 53 inches high. Tread is a narrow 53.5 inches in front and 54.3 at the rear. 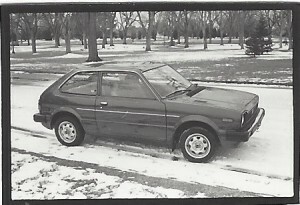 The Civic was introduced in this country in 1973. Honda also makes a larger Accord model and sportier Prelude. I borrowed the car for testing from Ralph Schomp Oldsmobile Honda at 2949 S. Broadway, Englewood.